One of the readin gs I was responsible for during my internship was The Library of Congress National Recording Preservation Plan. 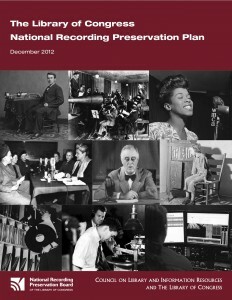 This booklet, released in December 2012, sets forth an ambitious plan for preserving the audio heritage of the United States, and addresses many of the obstacles to this process. I found the reading to be very technical, but also quite interesting. Early on, the authors bring up the idea of a National Directory that would act as a central database for all recorded sounds. Having a centralized database like this would enable sound archives, like the Marr Sound Archives, to know which records and historical broadcasts have already been digitized by other institutions. Not only would this help to organize all of the audio information out there, but it would allow sound archivists to better prioritize the digitization of their collections. This is an especially important issue considering that many really old recordings are beginning to breakdown, and archives are often overwhelmed by large workloads and underfunding. Also of interest is the way in which the book highlights the obstacles created by federal legislation. There is a federal copyright law that allows libraries and archives to copy audio recordings since 1972, but due to some strange nuances of the law, pre-1972 recordings are under a different copyright. Because of these issues, it is difficult to obtain permission to preserve pre-1972 recordings which happen to be the very ones that need it the most. Furthermore, these confusions make it more difficult to obtain funding for large preservation projects. The meditation on this reading will continue in the next post. This entry was posted in HistoryMaking and tagged Audio, copyright, Digitization, Library of Congress National Recording Preservation Plan, Marr Sound Archive on May 18, 2015 by Kelly Hanguer. waw indeed I would agree this preservation. and continue to maintain and continue to work colleagues.